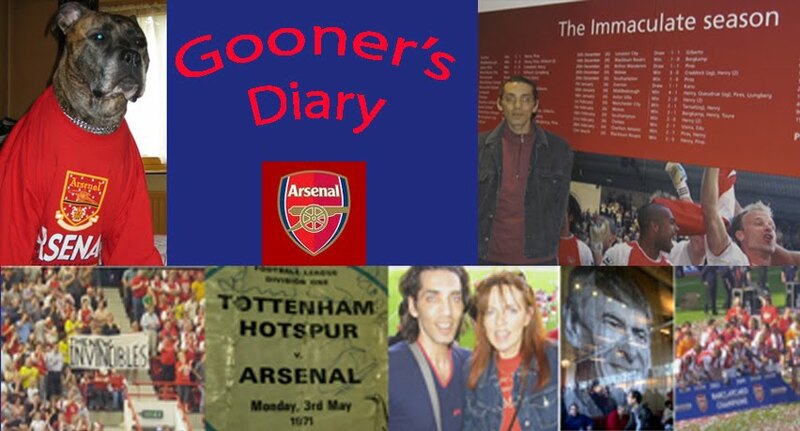 Gooner's Diary: The Famous Arsenal Could Be Destined For Wembley But Am I Being Greedy Demanding More? The Famous Arsenal Could Be Destined For Wembley But Am I Being Greedy Demanding More? A caption competition if ever I saw one? Having lazily posted a link to the edited version of my missive in the Irish Examiner, it suddenly occurred to me that I had better get this posted before tonight's game, where hopefully I'll be left feeling sheepish when Theo scores a hat-trick (and I'll happily eat my hat!). With Man City trumping such a damp squib of a transfer deadline day with the confirmation that Guardiola will be going there this summer, I'm sure that along with many other Gooners, this news only heightened my sense of quite how essential it is that we make the very most of the decidedly unusual circumstances, by winning the title this season. It seems to me that we might never again have a better opportunity, perhaps in my lifetime! As we've witnessed in the past, the mid-season announcement of a managerial change at the end of a campaign isn't exactly likely to have a positive effect on Man City. More commonly, I would expect that a lame-duck manager like Pellegrini might struggle to motivate his players when push comes to shove, at the business end of the season? But one thing is for sure, once Pep gets hold of the strings of the Qatari's ample purse, I think we can take it as read that the challenge from the blue half of Manchester is unlikely to be diminished next term! Moreover, surely the Mancunian reds can't possibly remain quite as mediocre as they are at present and it's hard to believe Chelsea will produce an encore of their disastrous start to this campaign. I'm still ignoring the astonishing prospect of Ranieri achieving quite such a miraculous coup at Leicester and imagine that I will only really be able to take this seriously, should the Foxes manage to maintain their challenge come Easter. Albeit that if the Gunners should end up falling short yet again, I'd love to see Leicester do it, if only because it would tickle me to think of Mourinho watching the Tinkerman pick up the title. With the transfer merry-go-round remaining quite so static (when everyone was expecting the extra TV cash to send it spinning into orbit! ), I guess it was inevitable that Arsène remained as inactive as the vast majority of his peers. Yet in view of the peculiar circumstances and the fact that we might never again have a better opportunity to walk off with the Premiership crown, I can't help but feel that a more intuitive manager might've made more of an effort to bring in a couple more bodies (especially when we've got the readies sitting there in the bank!). Sure, I can appreciate from that from le Prof's strictly scientific viewpoint, he's got players coming back from injury to bolster the squad (if the likes of Welbeck, Wilshere and Cazorla are to actually make it back to first team fitness in time to have some impact?) and there might well have been no patently obvious, available targets, who might be deemed a guaranteed upgrade on any existing squad members. Nevertheless, I struggle to believe that throughout the entire footballing world there wasn't a single available player who might've added a little more depth to our squad, for the sort of price that might prove comparatively paltry, compared to the additional financial reward of winning the title. Sadly they might've been lacking in sufficient Premiership experience, or the sort of journeyman pros that meant AW wouldn't afford them a second glance. Yet even if they were only to get no further than the bench for the remainder of the season, in the highly unlikely event that our first-choice XI stays fit for the duration, personally I can't help but focus on the psychological boost of our existing squad turning up at London Colney, to find a couple of new faces. Or those players who believe their squad place is guaranteed (Theo? ), suddenly feeling a little less secure and finding an additional 10/15 per cent commitment and determination, due to a little more competition for places. I get the distinct impression that Arsène's staunchest supporters are so accustomed to defending our glorious leader, in the face of the relentless criticism from the WOB that the man can do no wrong in their eyes. Doubtless they'll demand precisely "who?" but to be frank, I really couldn't have cared who, I simply wanted to see the one or two names splashed across the Sky Sports News ticker and grabbing today's headlines that wouldn't have cost the earth but which might've screamed a signal of the Arsenal's intent to go "all in" for the title this season and which would've undoubtedly added some slight skip to our squad's step against Southampton tonight. Still no point crying about what might've been! With me feeling the decidedly disturbing breath from the wrong end of the Seven Sisters Road on my neck and with Spuds travelling to Norwich, we badly need to bounce back from the Chelsea defeat, with a convincing win this evening. If we're going to produce a concerted challenge for the title, we urgently need to demonstrate that our existing squad has the wherewithal to go all the way. The Famous Arsenal Might Be Destined For Wembley But Am I Being Greedy Demanding More? When AW says jump, Alexis says "how high"
The Gunners started brightly against the Clarets, in the crisp winter sunshine on Saturday. With Le Coq retrieving possession so much higher up the park, instead of allowing opponents freedom to bear down upon and discombobulate our defence and with Alexis restoring some much needed zip to our play, the long-awaited return of some pleasing on the eye, fast, free-flowing footie ensured that it was patently apparent quite how much these two players have been missed, during their enforced absence. When Alexis eventually dissected the massed ranks of Burnley’s defence, following a period of the sort of patient probing that’s all too often resulted in a frustrating lack of end product in recent weeks, I had the good fortune to be blessed with the perfect view, as Calum Chambers exquisitely caressed the ball goalwards. Chambers was wheeling away towards the corner flag to celebrate, before the ball had even found its target, as he and I both knew, with absolute certainty that he couldn’t have got the physics more precise, if he’d sat down and calculated the jaw-dropping trajectory with a slide-rule. To describe it as a shot would be vulgar, as this was a billet-doux from our young full-back, a thing of such rare beauty that it was inevitably curling it’s way into the top corner of the net. Unfortunately, as the sun sunk behind the Clock End, the temperature on the terraces and the isotherms of this encounter both dipped dramatically. In the more tepid remainder of this match there was little evidence of the sort of cup “blood and thunder” that sadly only seems to exist nowadays in the imagination of the tabloid hacks. Time was when the likes of Burnley would’ve been far too embarrassed to dare show their faces back at Turf Moor, after exiting the competition by way of a display in which a solitary booking was hardly testament to the Clarets getting “stuck in”. With it being so long since we last lost in this competition, I suppose it’s inevitable that we’ve become irritatingly blasé, but I must admit to feeling a little envious, upon seeing evidence of far more FA Cup fervor in the atmosphere seen at success-starved grounds like Fratton Park, when watching highlights on the box later that same night. My disappointment at discovering Reine-Adelaide’s absence from the teamsheet was tempered by the prospect of getting a first glimpse of our new Egyptian midfielder in the starting XI. As one would expect of a Wenger signing, Elneny appears very comfortable in possession. Mercifully, with him not being another midfield midget, he might well prove a useful addition, depending on how quickly he adapts to the unrelenting intensity of Premiership footie. With Giroud, Alexis, Iwobi and the Ox all included in a positive looking line-up, I was hoping the Gunners would go on to bang in the few goals that might boost our confidence. Yet after Vokes caught us napping, heading the Championship side back on even terms on the half hour mark, we seemed to sit back and wait, in expectation that Burnley would eventually roll over. Thankfully we managed to conjure up the beautiful box to box move that resulted in Alexis scoring what eventually proved to be the winner, but there remained the unnerving risk of us conceding again and being left faced with a long trek North, at a time when we can least afford the dreaded prospect of a replay impinging on an already crowded fixture schedule. One man down, one man up! Watching us making such a meal of keeping an in-form, but comparatively agricultural Burnley at bay during the second half, I found myself contemplating the positively terrifying prospect of us having to contain the likes of Messi, Suarez and Neymar in only a couple of weeks time! Walcott really should’ve sealed our progress with a third when he appeared late-on, but in fluffing his lines, Theo only managed to reinforce our lack of faith in him as a viable alternative to Giroud. Nevertheless, unless Arsene’s got an unlikely surprise up his sleeve, it’s looking increasingly likely that we might be left another man down come transfer deadline day, with the exit of Debuchy. With Rosicky’s long awaited 20 minute cameo only resulting in the depressing news of him picking up yet another injury, it’s not as if the shelves at London Colney are looking particularly well-stocked with fresh produce for an assault on all three fronts? Still with yet another home draw against lower league opposition in the 5th round, the fates at least appear to be smiling kindly on our efforts to repeat Blackburn’s ancient "three in a row” feat. No Heart, No Guts.....No Glory! Danny's Back...And With Some Bang!